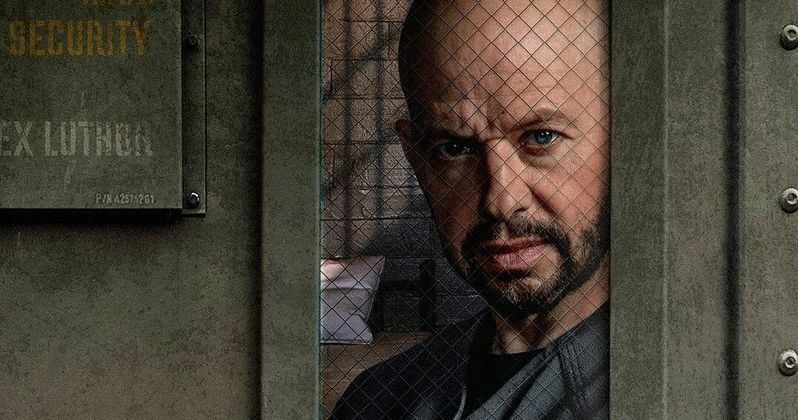 Jon Cryer's Lex Luthor is locked up in the first-look image from The CW's Supergirl. Cryer will make his debut in an episode titled, O Brother Where Art Thou?, which hits the small screen in March. The episode will see the villain reaching out from prison to enlist the help of Lena Luthor (Katie McGrath). The synopsis for the episode states that he will do anything to get her on his side, "even if that means leveraging the life of one of her friends." Jon Cryer looks excellent as Lex Luthor in the image, sporting the iconic bald head with a bit of scruff on his face. For some, the Emmy-winning co-star of Two and a Half Men seemed like a pretty weird decision to tackle one of the most iconic villains in comic book history. However, Supergirl executive producers Robert Rovner and Jessica Queller recently revealed that Cryer was always their choice. They had this to say. "We are enormous fans of Jon Cryer, and he was instantly our dream actor to play the iconic role of Lex Luthor. Jon is a super-talent, and the fact that he played Lenny Luthor in Superman IV brings an added layer of legacy to his casting. We're beyond thrilled to welcome Jon to the Supergirl family." As for showing up in future Supergirl episodes, it appears that Jon Cryer will be weaving through the rest of the season, according to Robert Rovner and Jessica Queller. They also revealed that it has been their intention since the beginning to have Lex Luthor involved in the show. The two went on to say, "We can't wait for him to shake things up in National City and watch him go toe to toe with not only Supergirl, but his sister Lena Luthor." This isn't Jon Cryer's first time playing a Luthor in the Superman franchise. The actor, who was 21-years old at the time, appeared in the 1987's Superman IV: The Quest for Peace as Lenny Luthor, the nephew who helps his Uncle Lex escape his prison and they try to take Superman down. So, this role isn't too much of a stretch for Cryer, even though he is probably best-known for his comedic abilities starring alongside Charlie Sheen. Supergirl airs Sundays at 8 PM on The CW and the latest season is about to get kicked up a notch with the addition of Jon Cryer's Lex Luthor. Cryer will make his debut on the March 17th episode. The hit show stars Melissa Benoist as Kara Danvers/Supergirl, Mehcad Brooks as James Olsen, Chyler Leigh as Alex Danvers, Jeremy Jordan as Winslow "Winn" Schott, Katie McGrath as Lena Luthor, Jess Rath as Brainiac 5, and David Harewood as Hank Henshaw/J'onn J'onnz. You can check out the first-look image of Jon Cryer as the villainous Lex Luthor below, thanks to the Supergirl Twitter account.